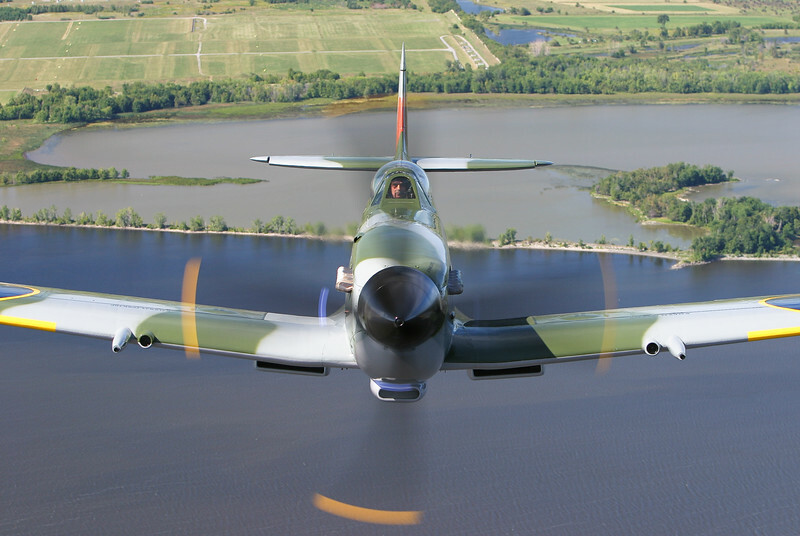 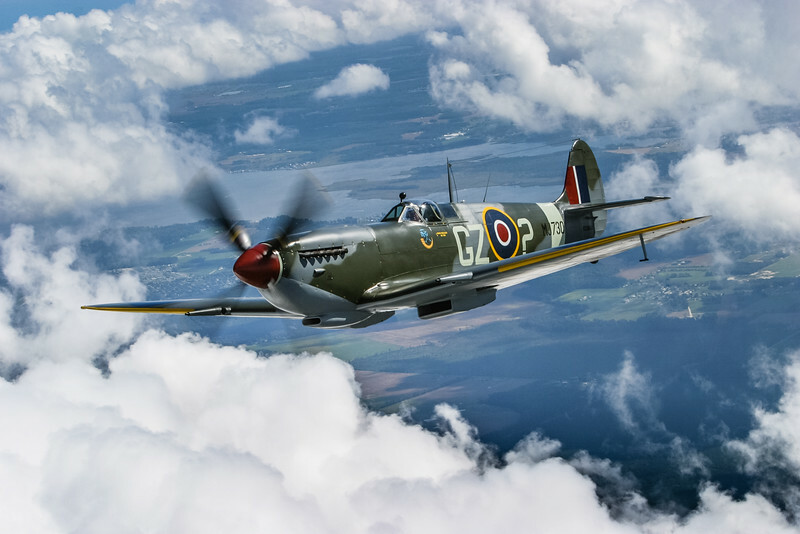 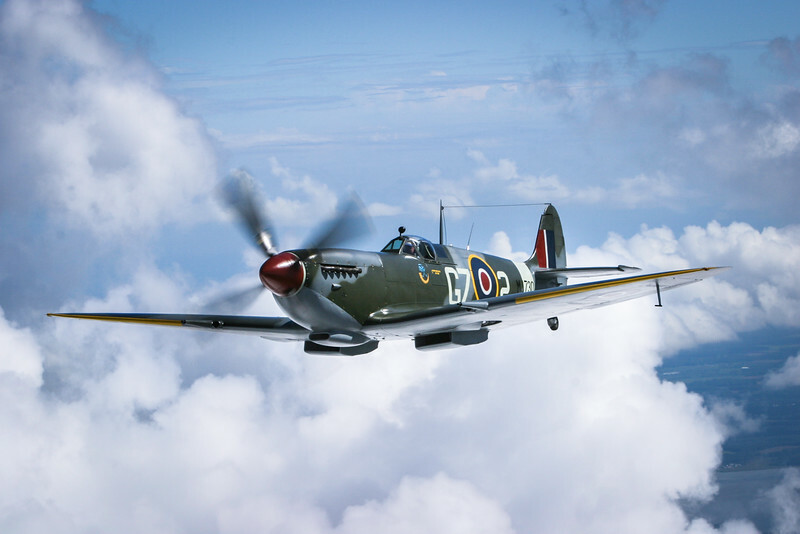 Jerry Yagen in his magnificent Supermarine Spitfire Mk.IX MJ730 over the Delaware countryside . 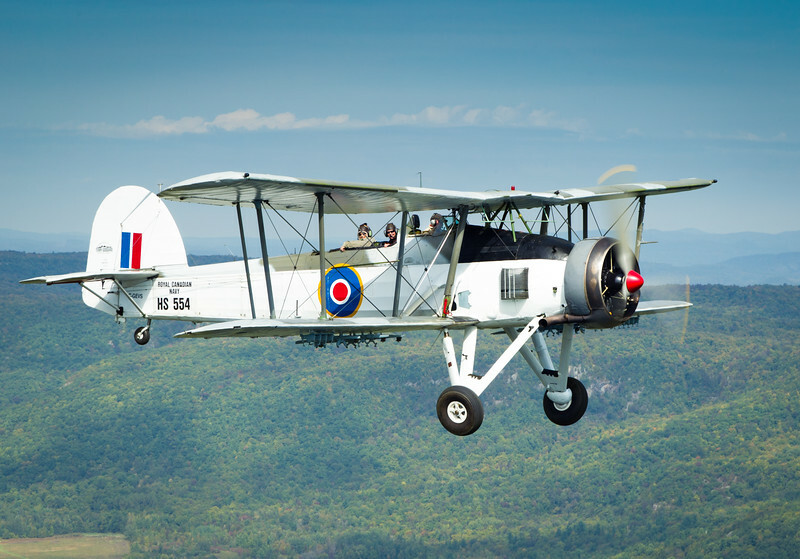 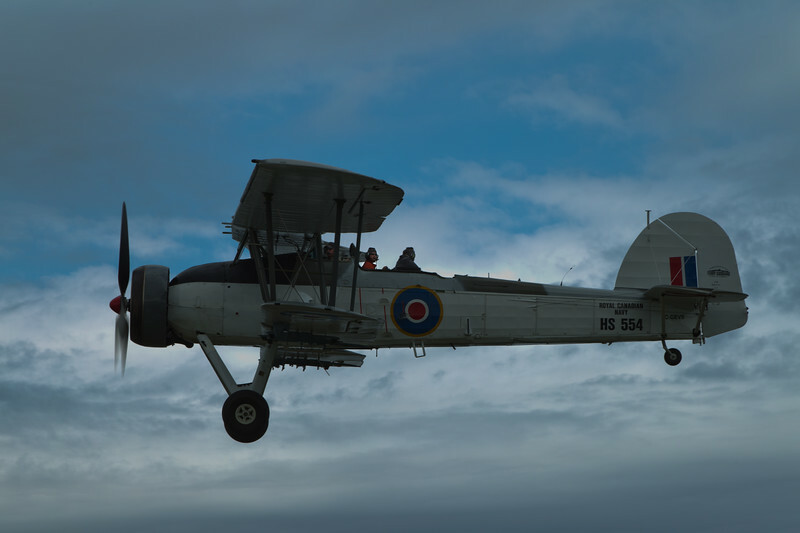 Vintage Wings of Canada's Fairey Swordfish over the Gatineau Hills. 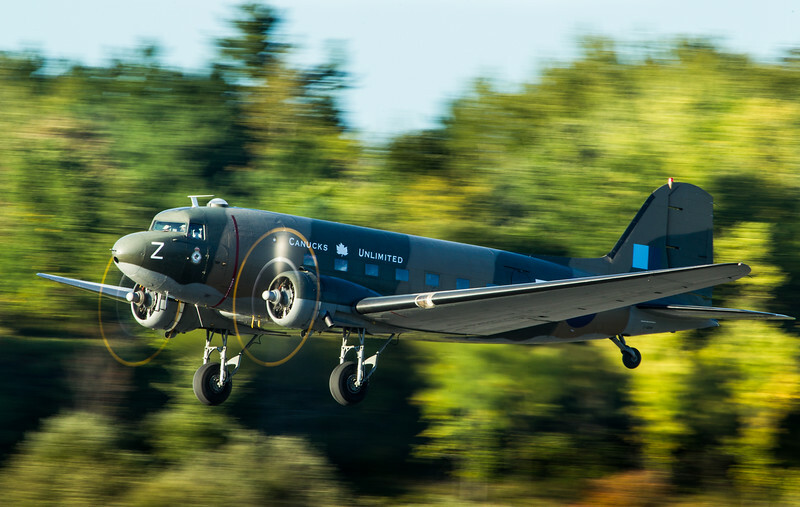 Canucks Unlimited taking off into the setting sun in Gatineau, Quebec. 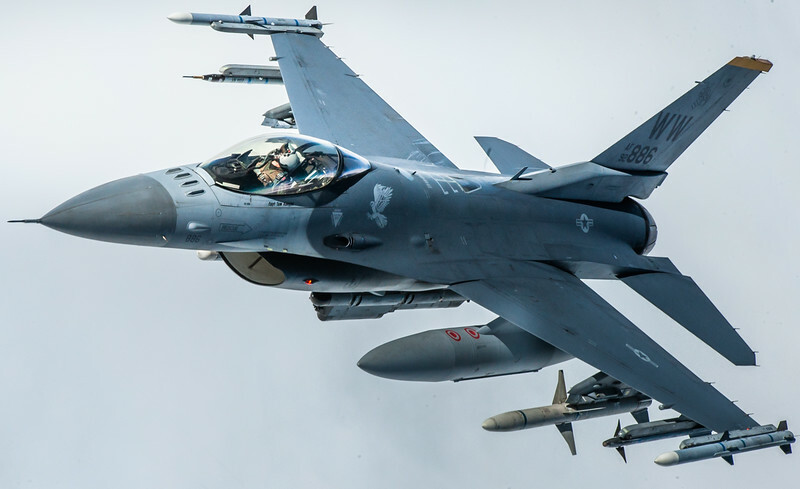 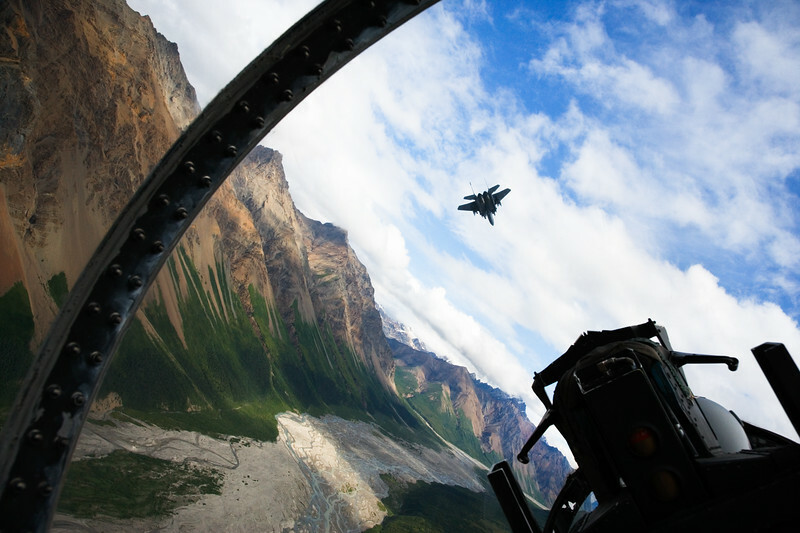 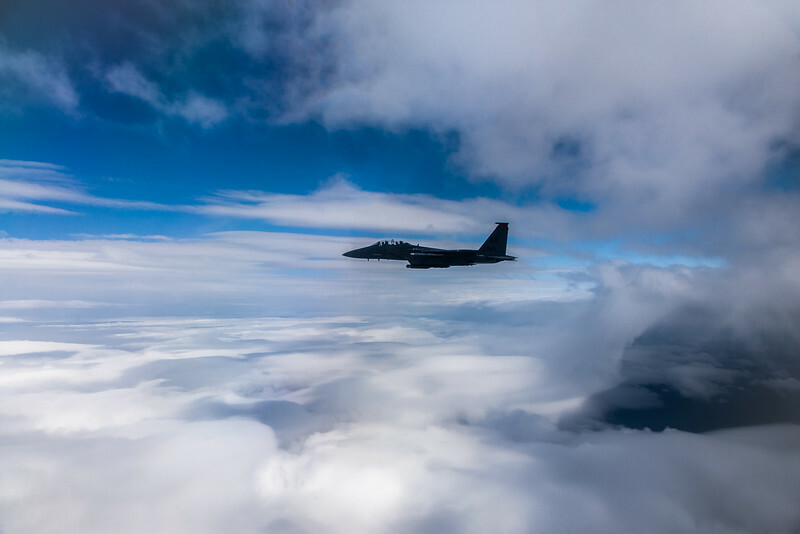 'Wild Weasel' coming into refuel above the overcast landscape near Fairbanks, Alaska. 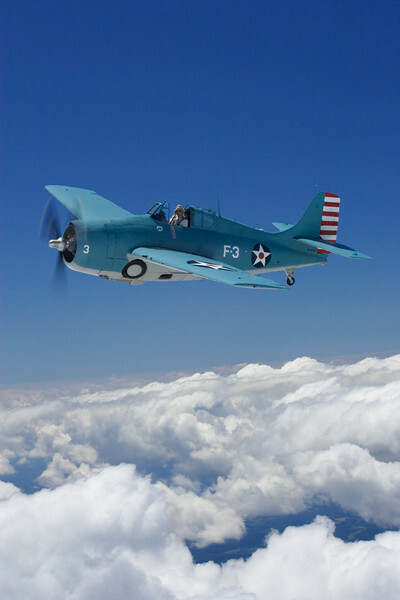 A Wildcat above the clouds near Akron, Ohio. 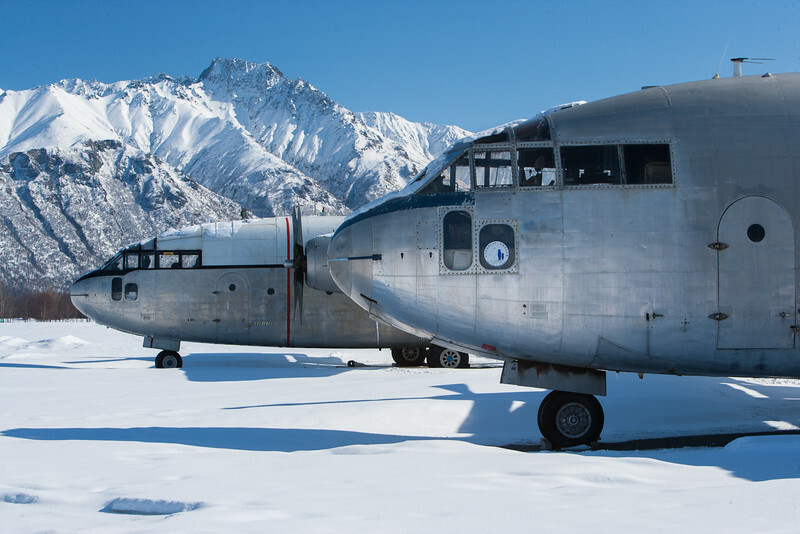 A pair of C-119's in winter slumber awaiting the thaw when their engines will roar again in Palmer, Alaska. 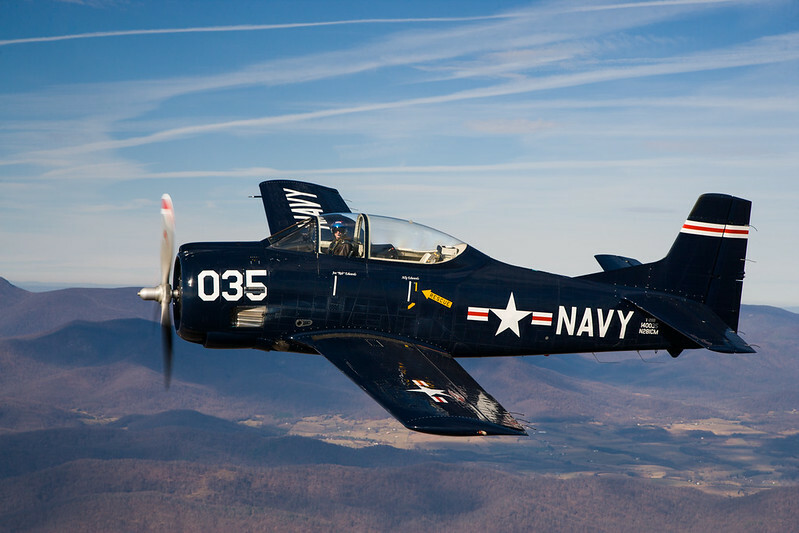 Former shuttle astronaut and F-14 test pilot, Joe Edwards wings his T-28 over the Blue Ridge Mountains, near Winchester, Virginia. 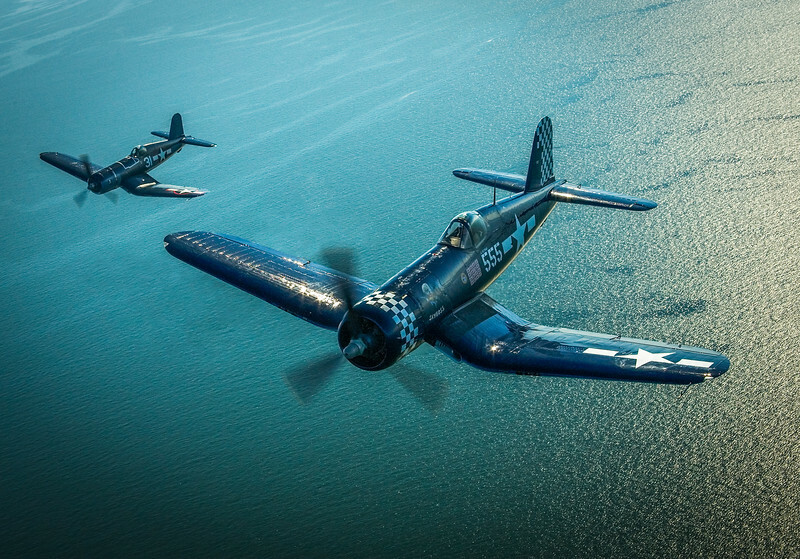 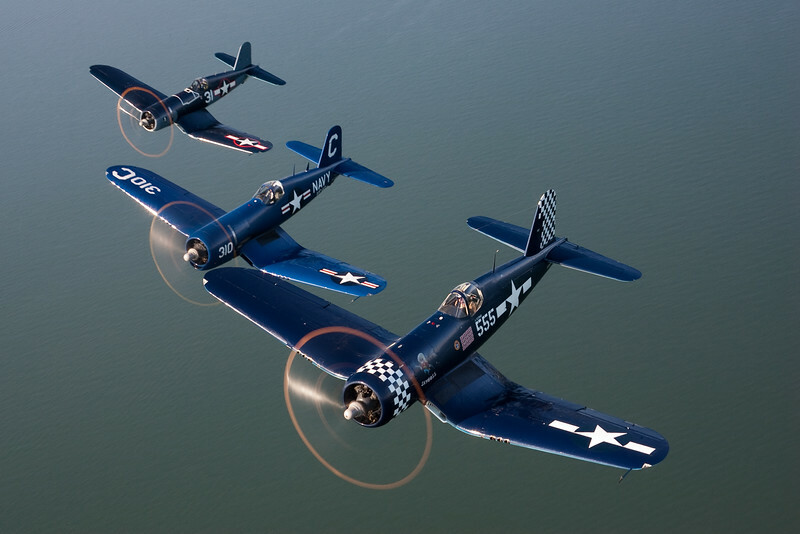 Corsairs above Long Island Sound near Bridgeport, Connecticut. 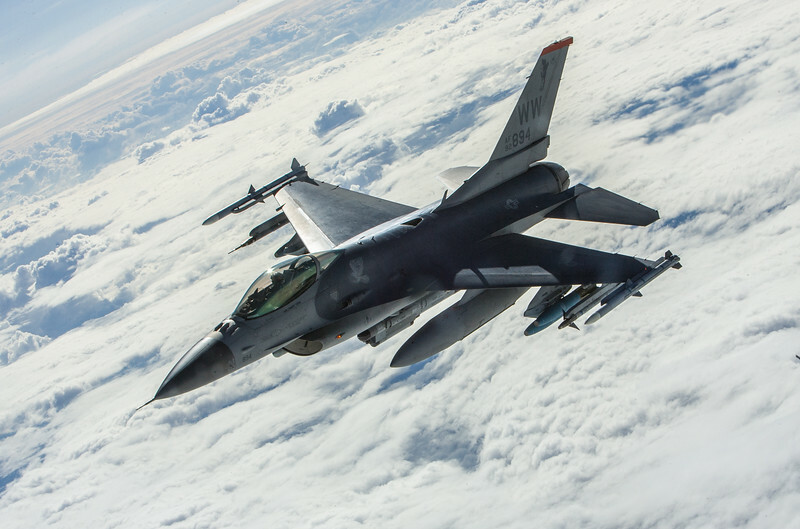 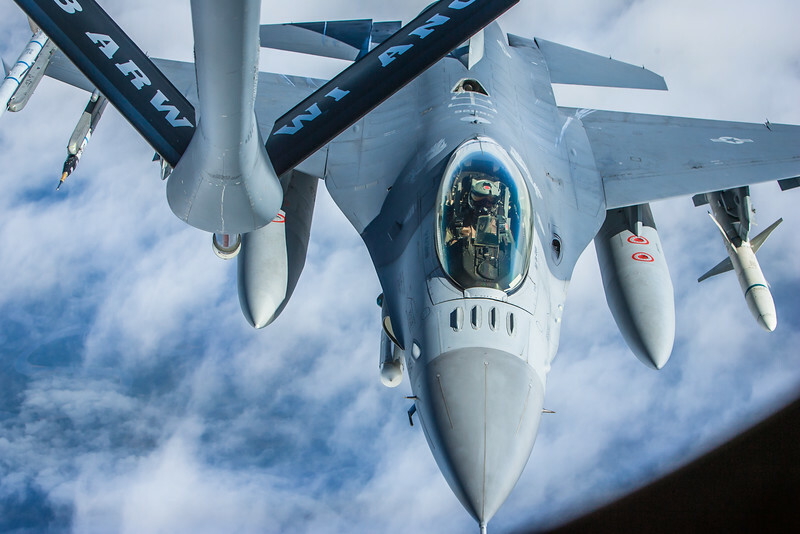 A' Wild Weasel' approaching the refueling boom of a Wisconsin ANG KC-135 near Fairbanks, Alaska. 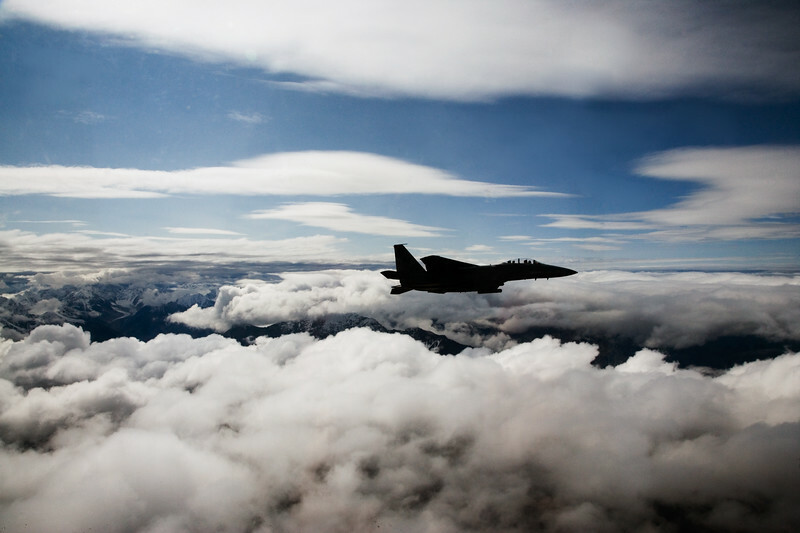 A 'Wild Weasel' over the clouds near Fairbanks, Alaska. 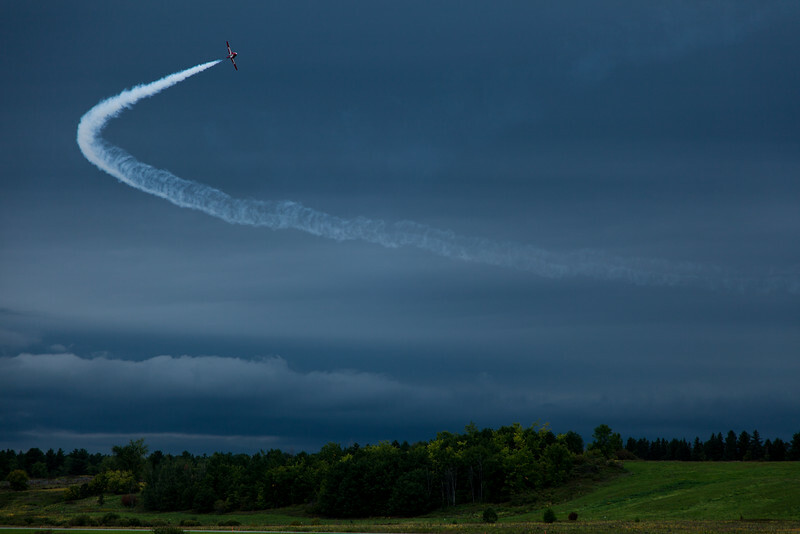 A lone Snowbird arcing through the thunderous sky at Gatineau, Quebec. 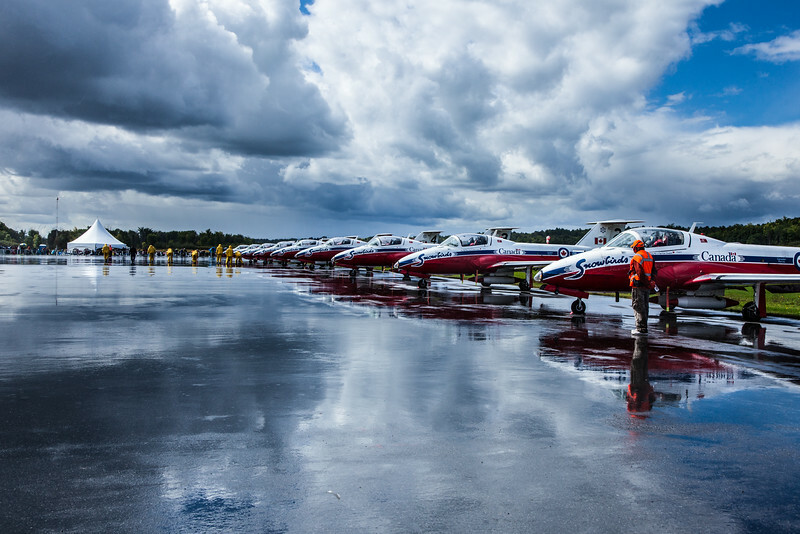 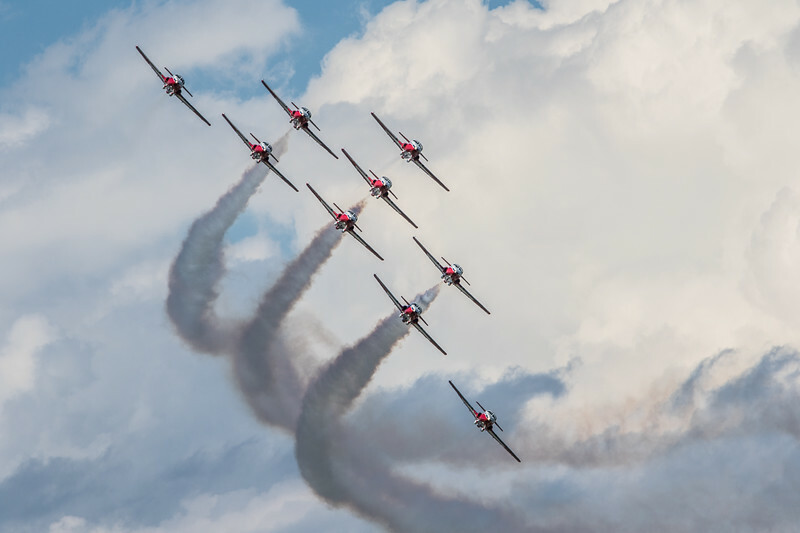 The Snowbirds after a shower at Gatineau, Quebec. 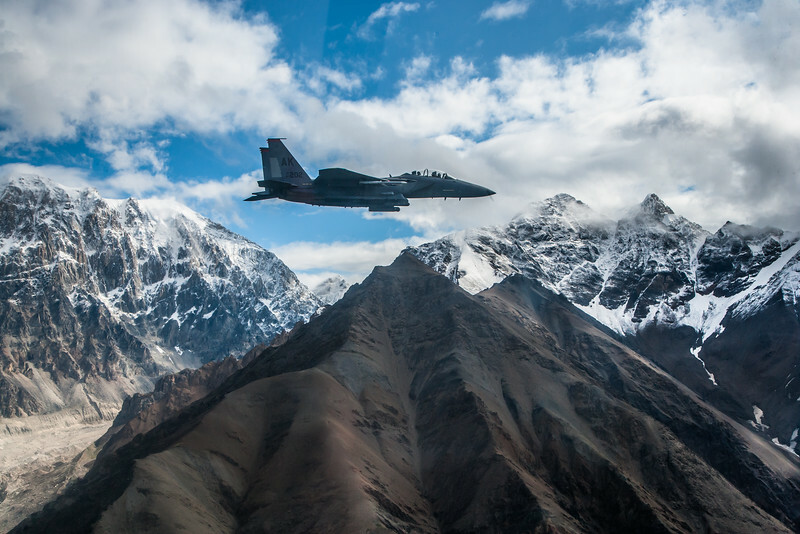 Colonel Randy 'R2' Roberts then-commander of the 3rd Operations Group in his 90th Fighter Squadron F-15E Strike Eagle over the Chugach Mountains in Alaska. 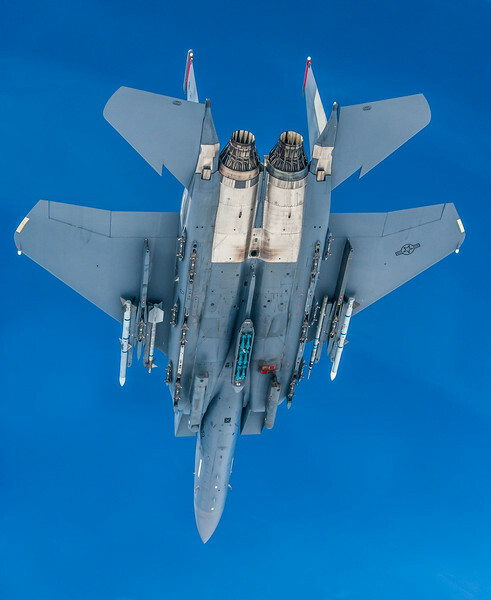 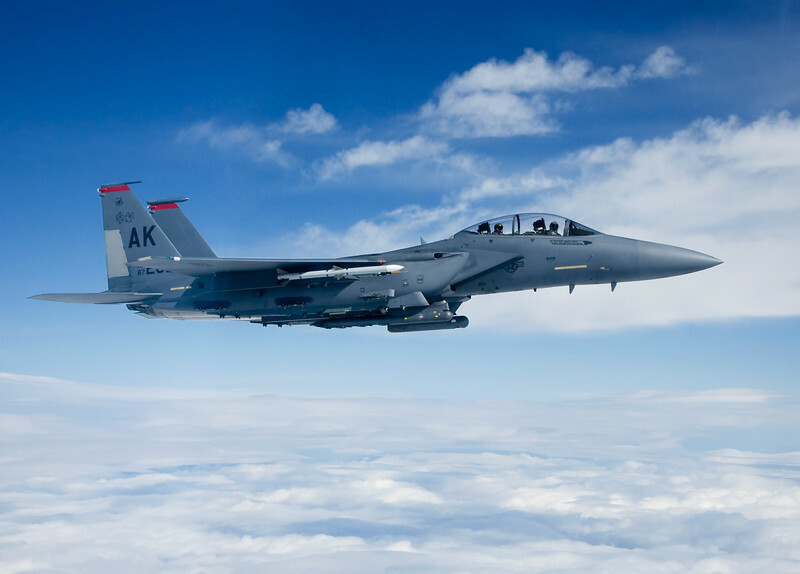 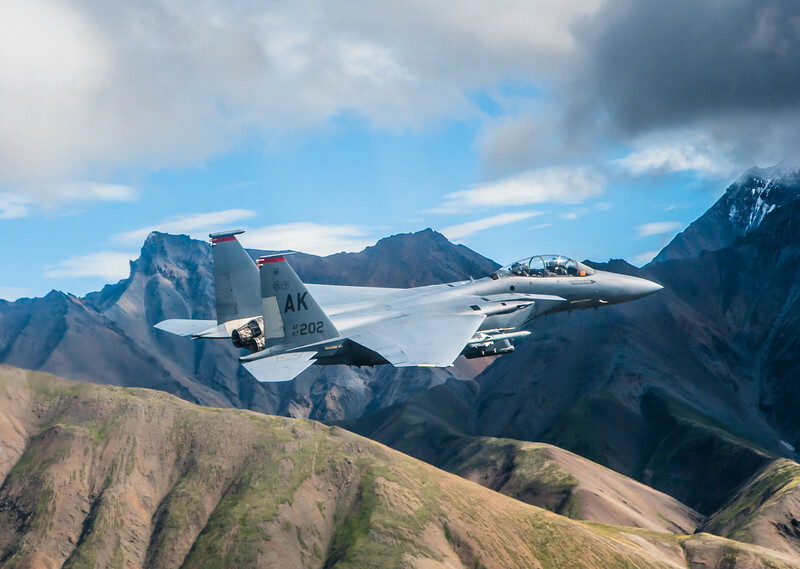 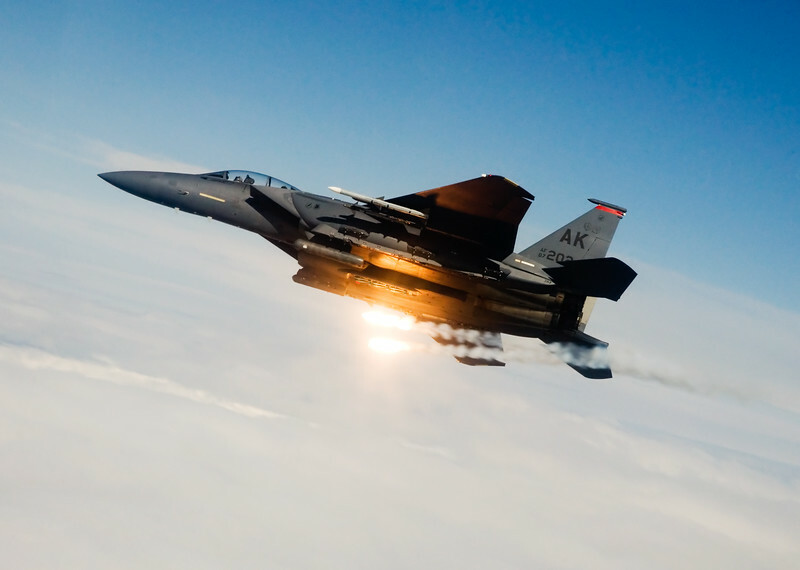 F-15E over the Chugach Mountain range, 80 miles east of Elmendorf AFB in Anchorage, Alaska. 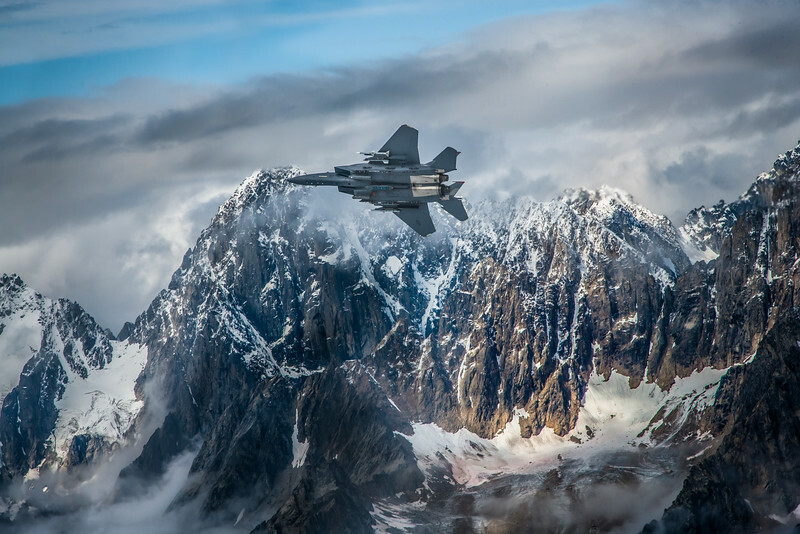 Colonel Randy 'R2' Roberts then-commander of the 3rd Operations Group flies his 90th Fighter Squadron F-15E Strike Eagle above the clouds over the Chugach Mountains in Alaska. 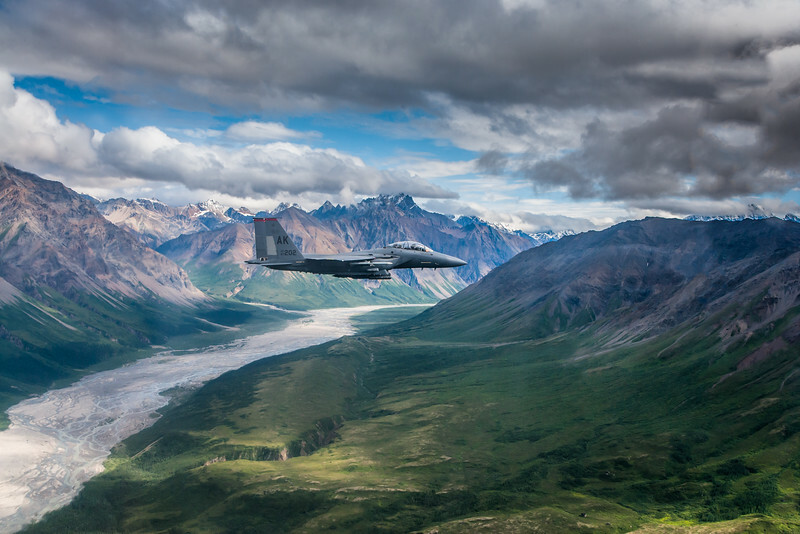 Colonel Randy 'R2' Roberts then-commander of the 3rd Operations Group wheels his 90th Fighter Squadron F-15E Strike Eagle through the Chugach Mountains in Alaska. 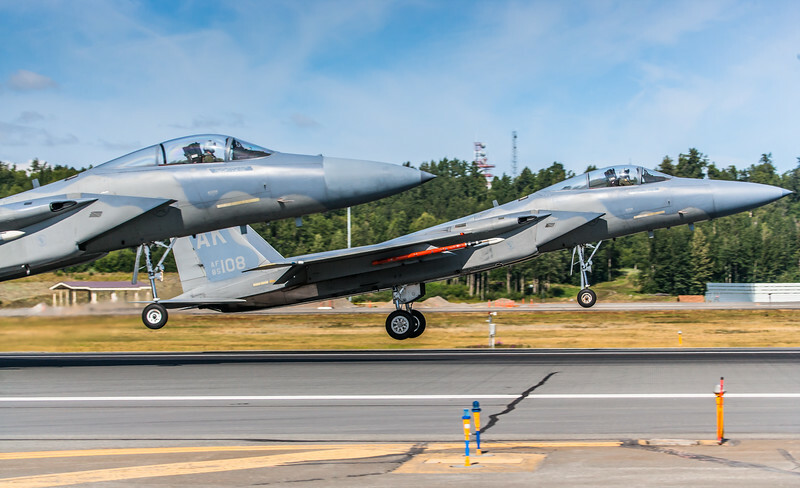 F-15C Eagles land side-by-side at Elmendorf Air Force Base in Anchorage, Alaska. 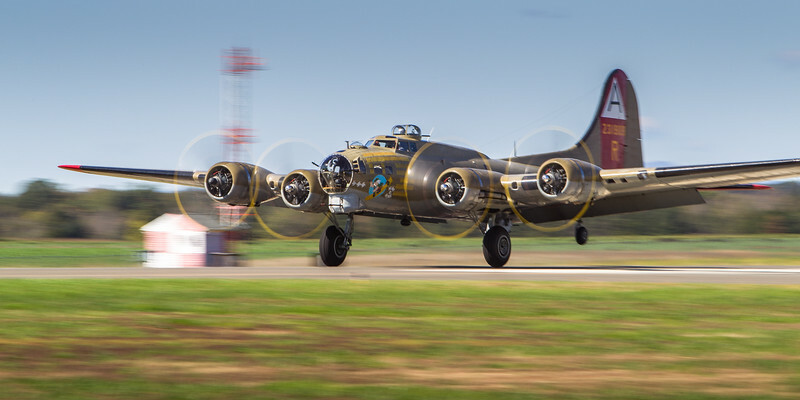 B-17G 'Memphis Belle' takes off in Hamilton, Ontario. 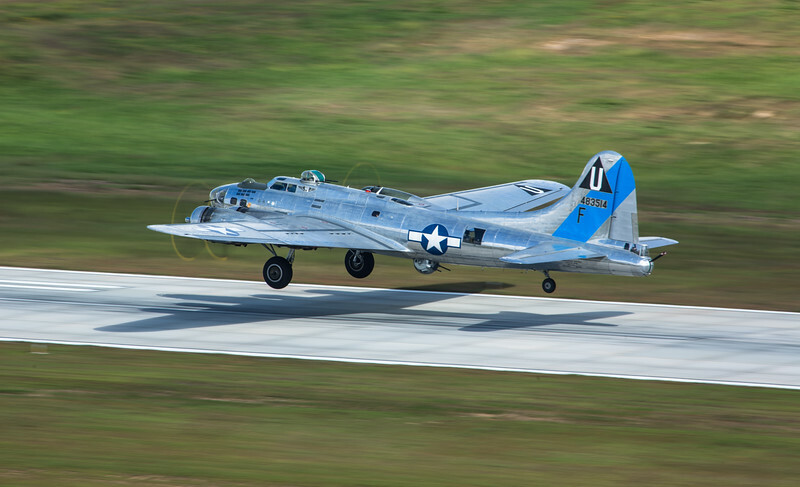 The Collings Foundation's B-17G 'Nine-o-Nine on take off. 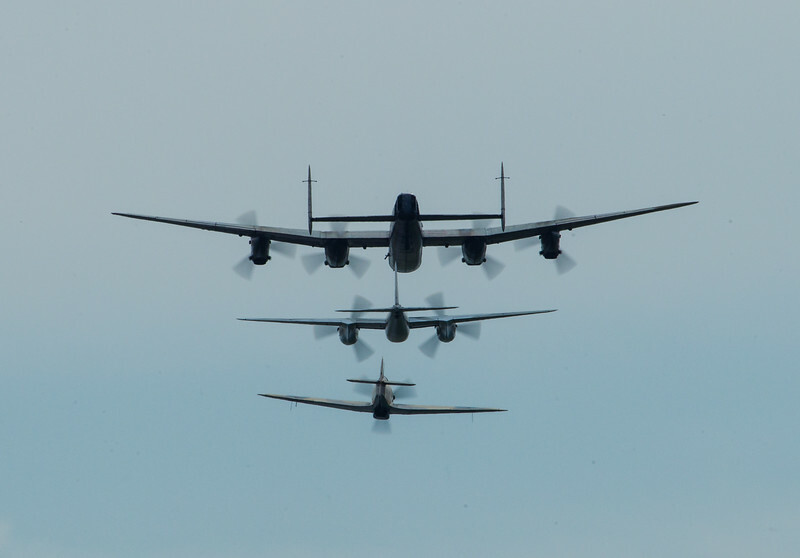 The Canadian Warplane Heritage Museum's Avro Lancaster lines up in silhouette with Jerry Yagen's deHavilland Mosquito, and Vintage Wings of Canada's Hawker Hurricane Mk.IV. 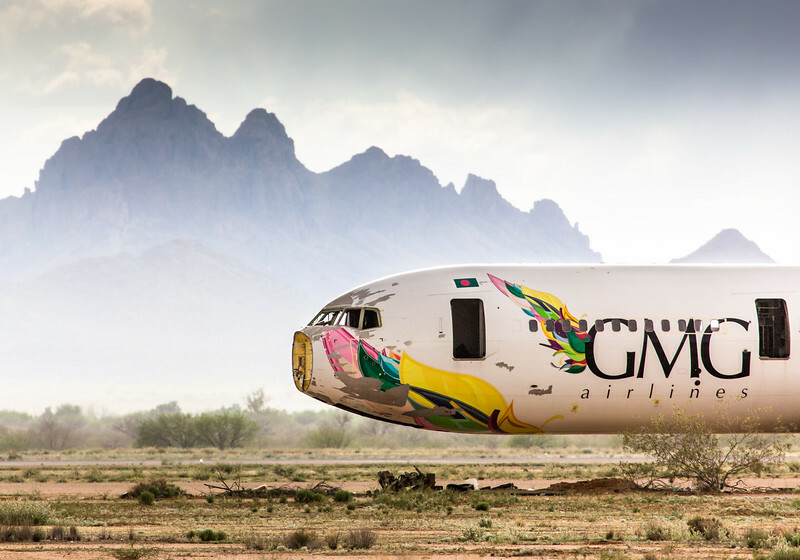 GMG Airlines Boeing 767-300 N617SC at Marana-Pinal Air Park, near Tucson, Arizona. 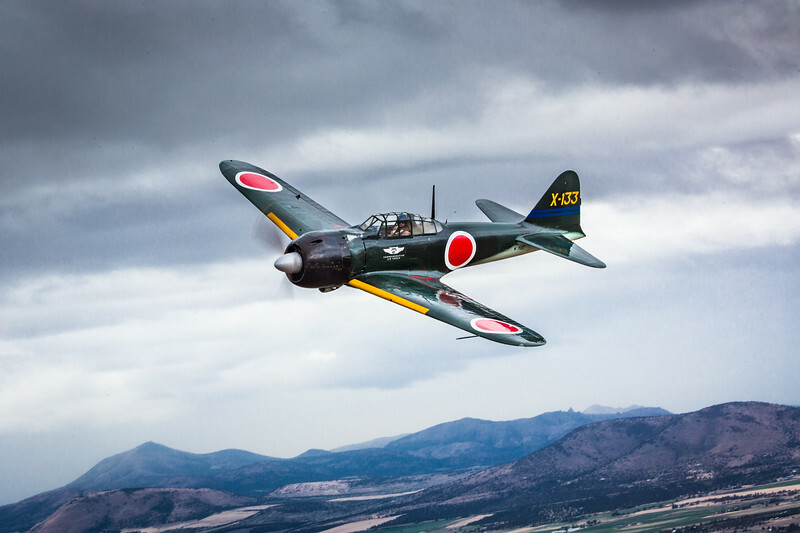 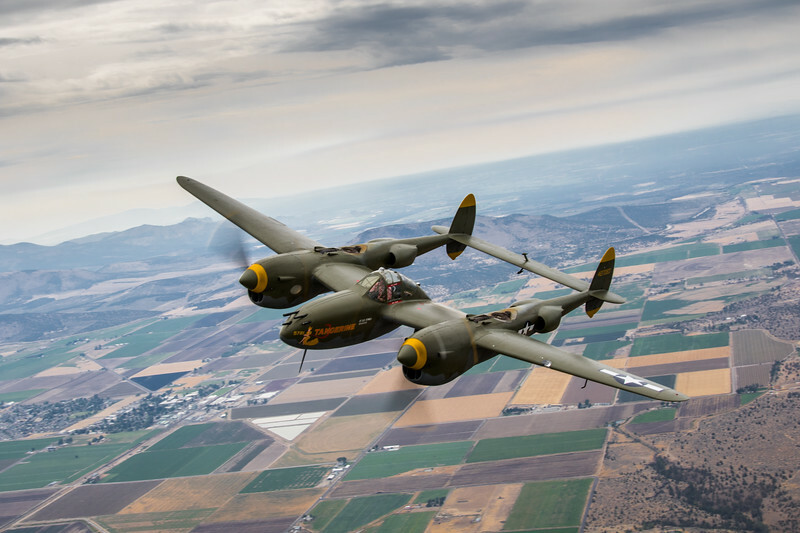 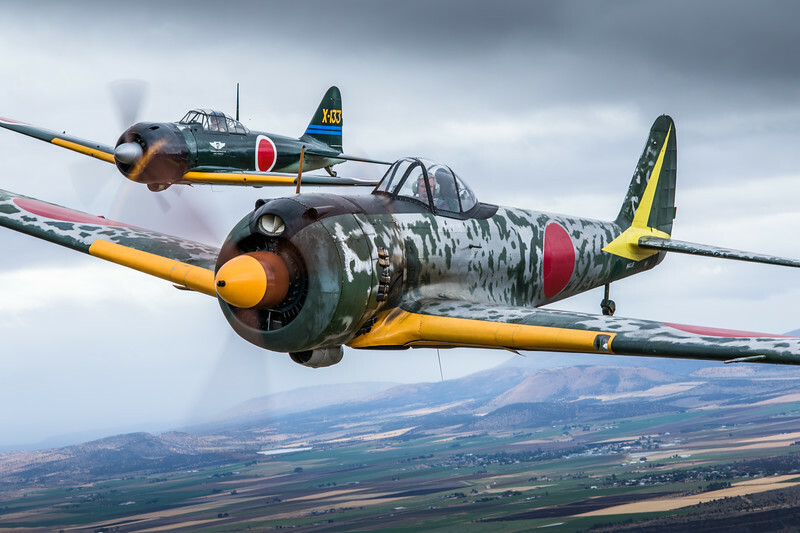 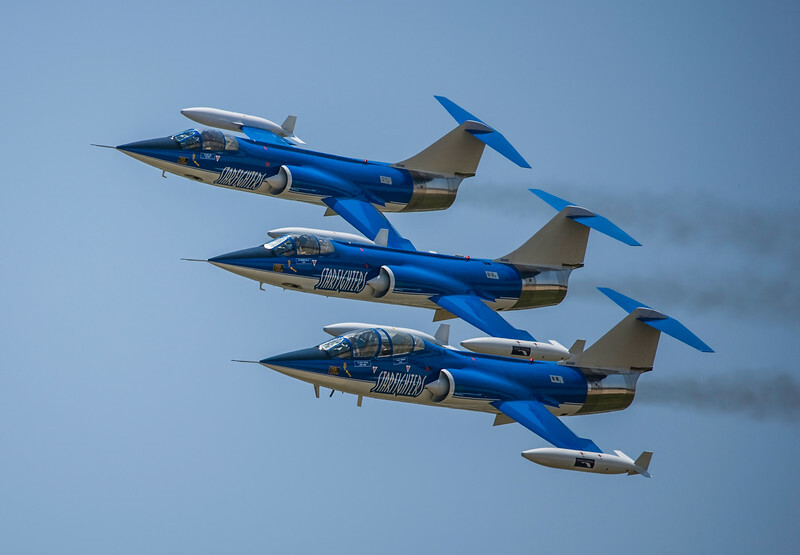 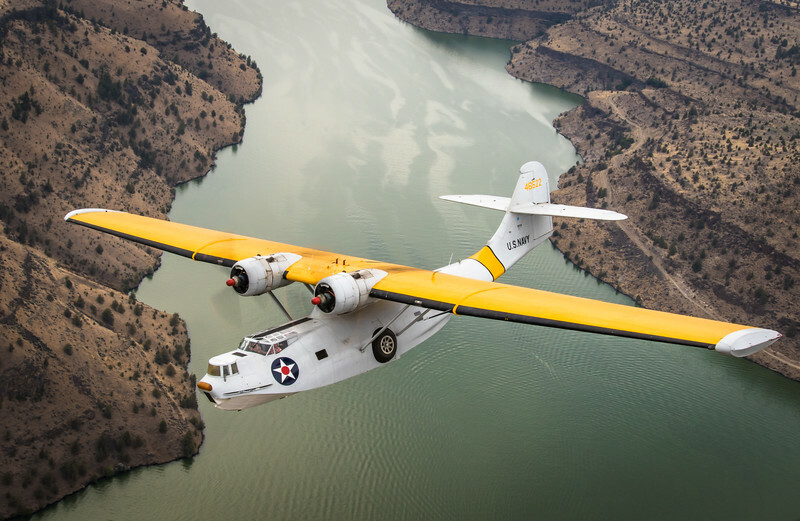 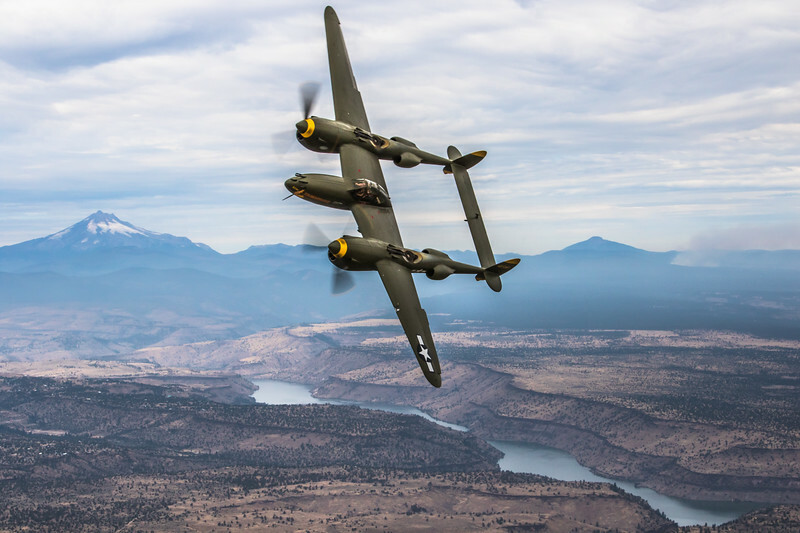 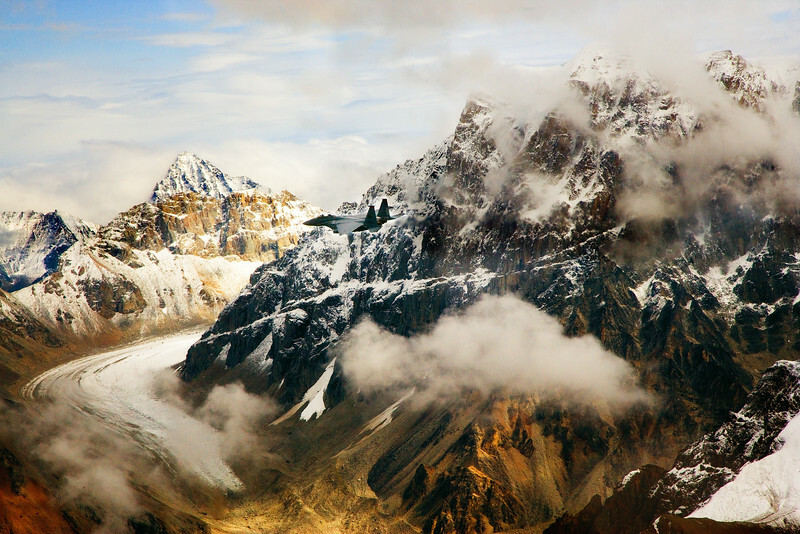 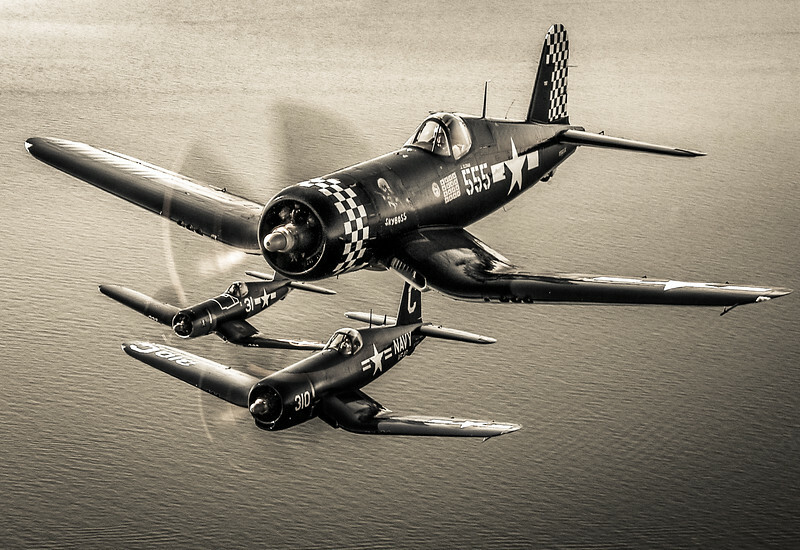 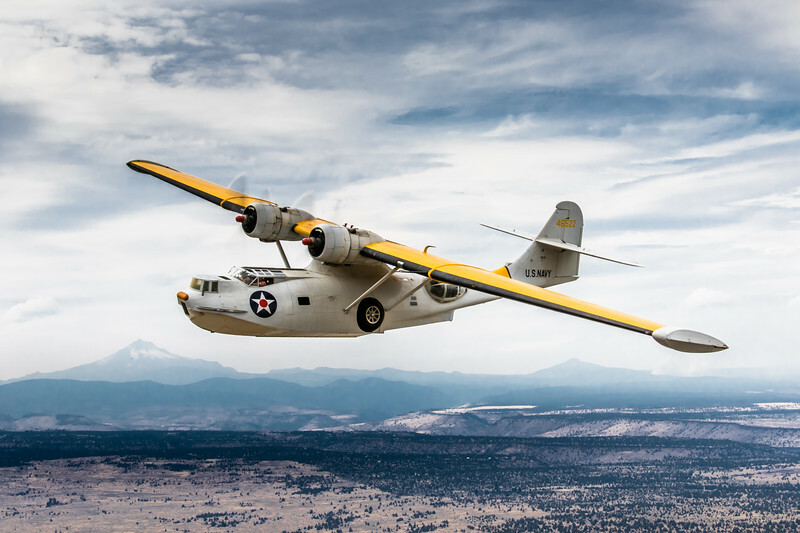 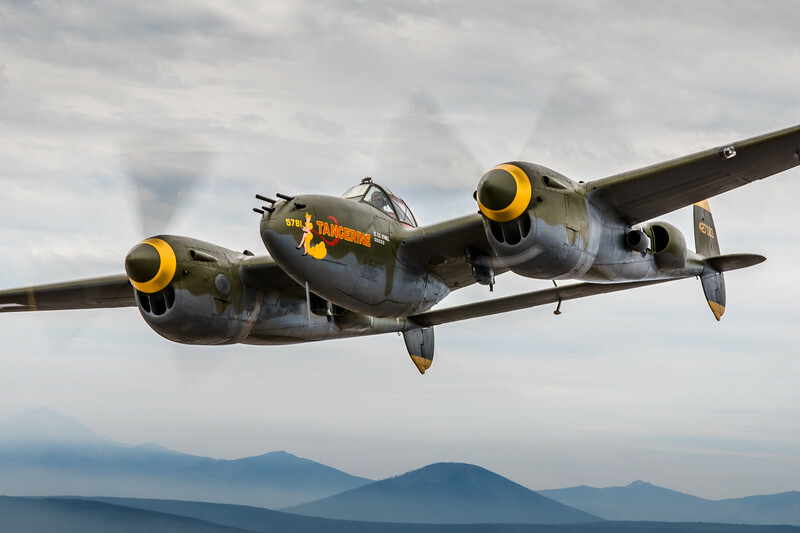 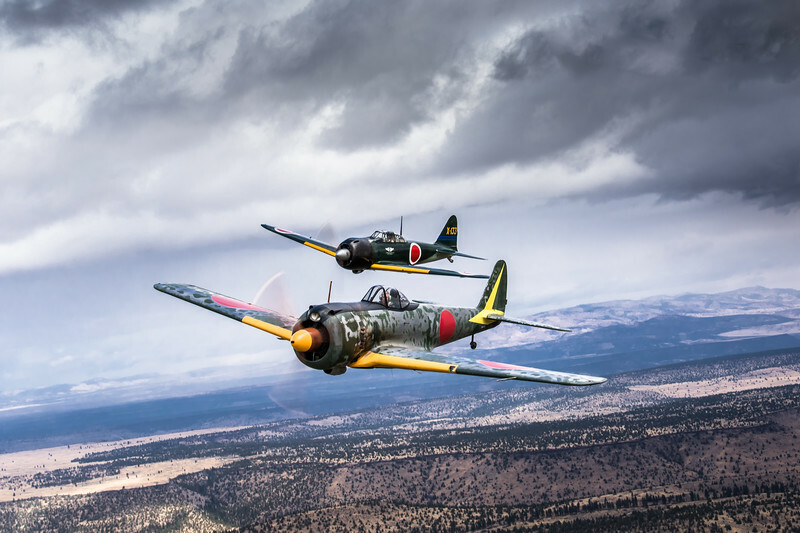 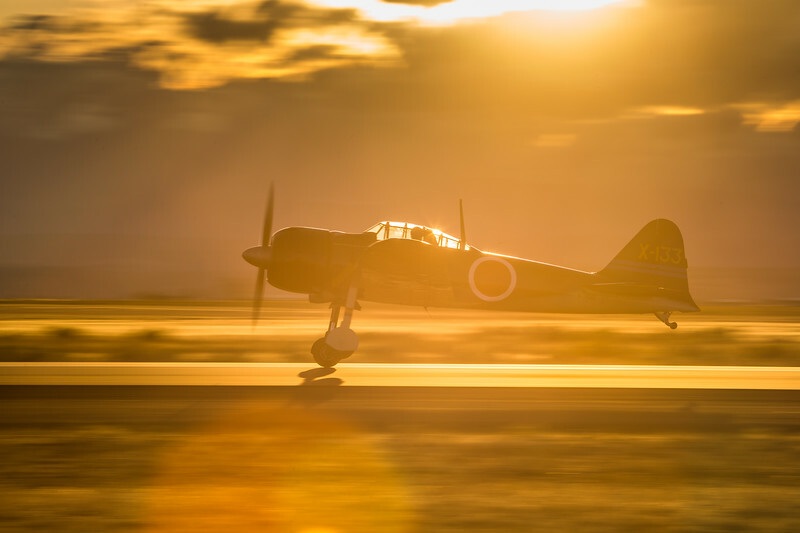 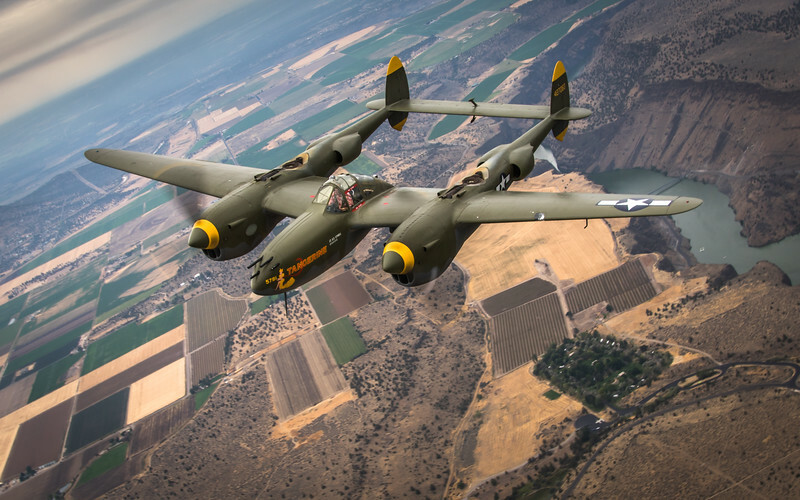 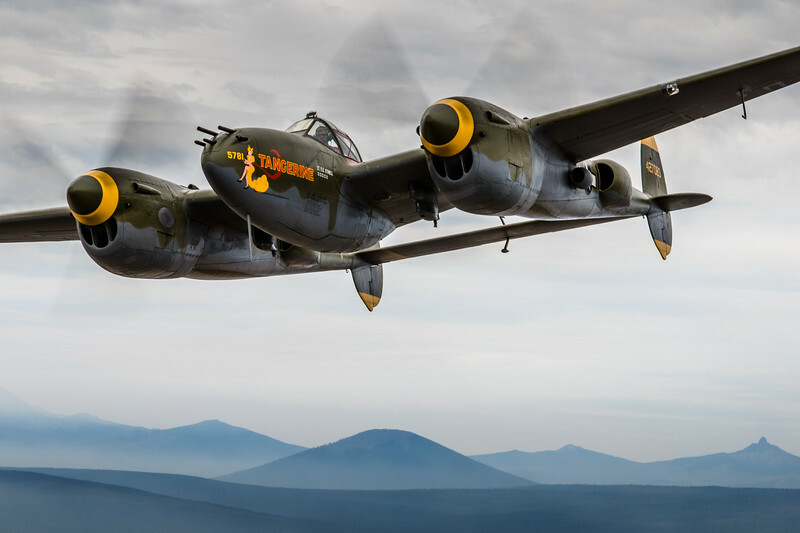 This image is a finalist in the 2015 Smithsonian Air & Space Magazine photography competition. 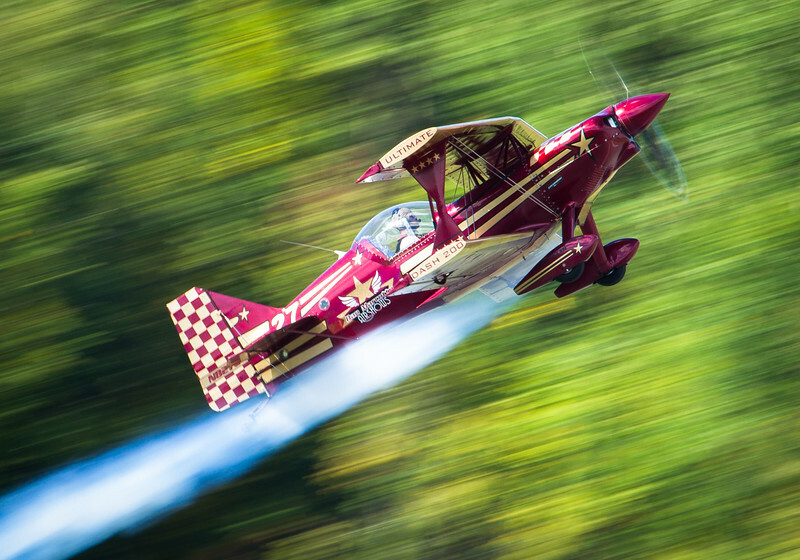 Dan Marcotte roars into the sky at the Wings Over Gatineau air show this fall in his unique Ultimate 10-200 Biplane, designed by the legendary RCAF fighter pilot, Gord Price.